Today is Part 3 of A Crystal Clear Vision linens! 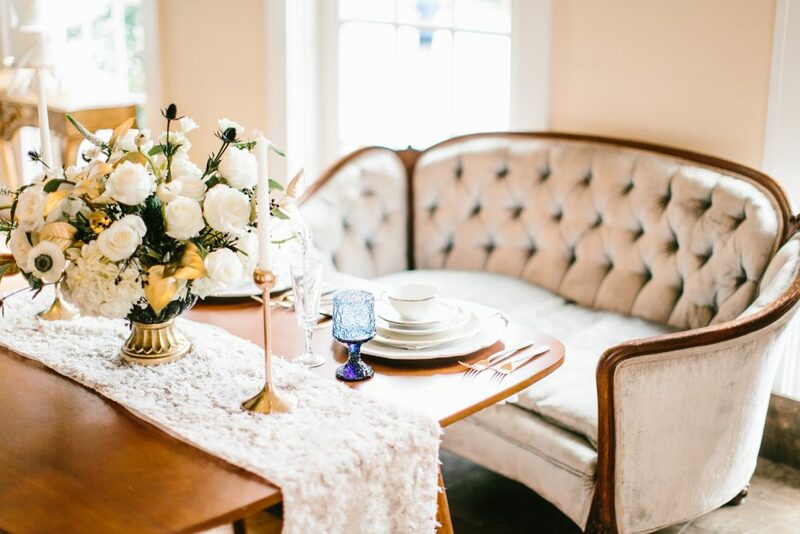 We’ve got 5 more tablescapes to show you with all of the linen and decor details! 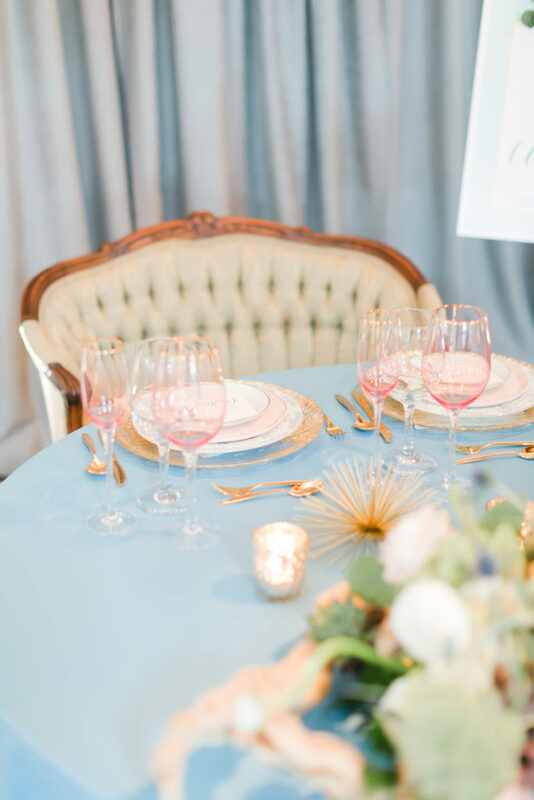 Check out the tables that Kirstyn Marie Photography captured: A Lively Affair, Carolyn Celeste Weddings, Chef By Design, East Beach Catering, & Soirees By Lauren. 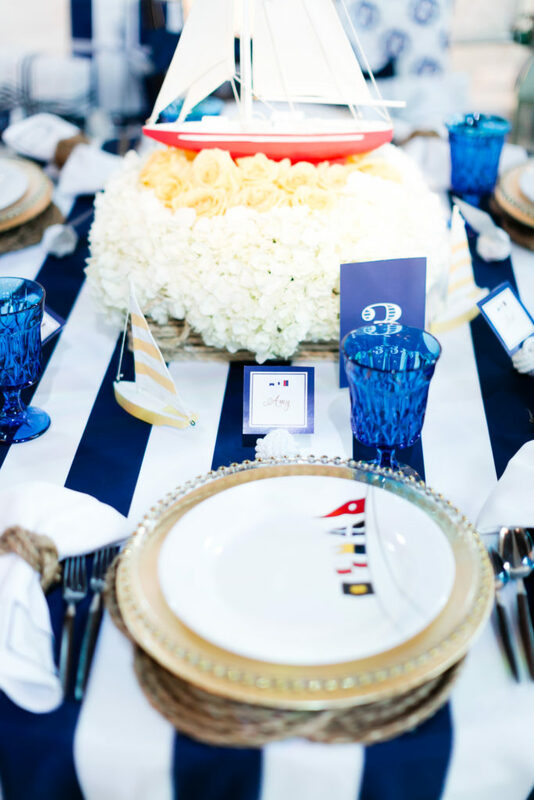 We love a good nautical theme and A Lively Affair definitely delivered with their “coastal chic” table design! 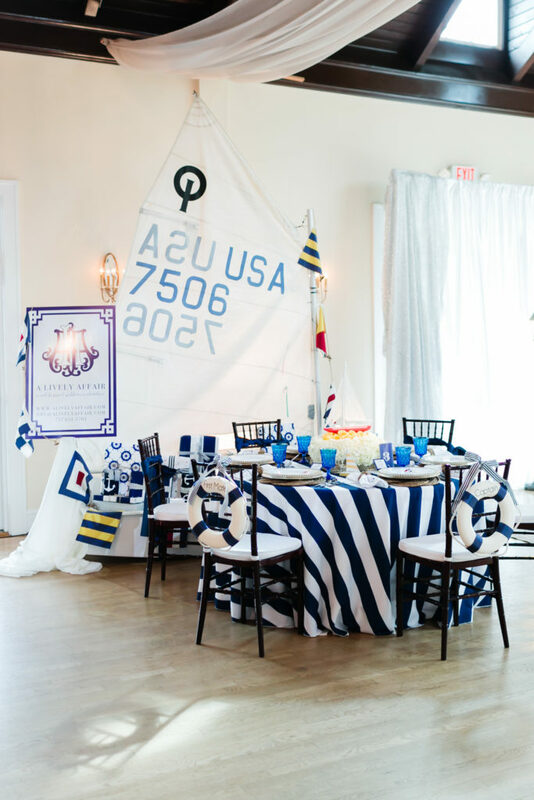 Our bold Navy and White Stripe Polyester linen was the perfect choice for this table and was a great base for all of the sailboat inspired decor on the table! 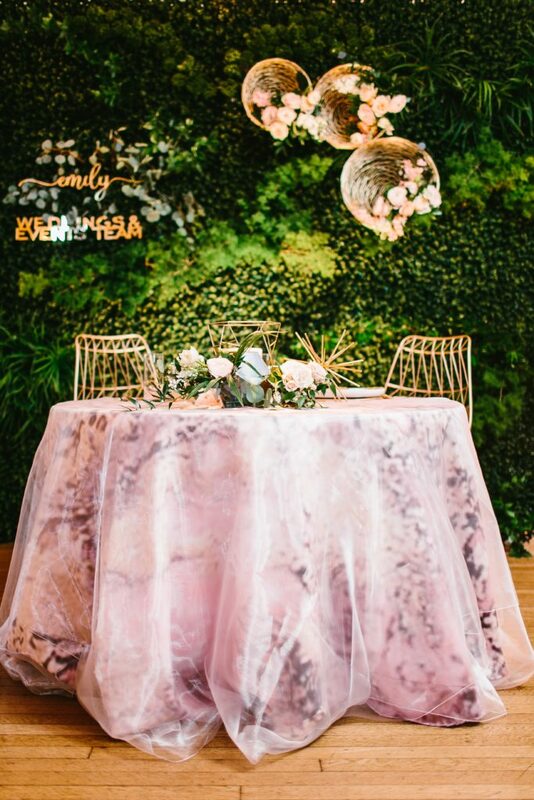 Can we just take moment to reflect on the fact that Carolyn Celeste Weddings had actual TURF and SOD as part of her table design? I mean, it does not get more innovative or creative than that! 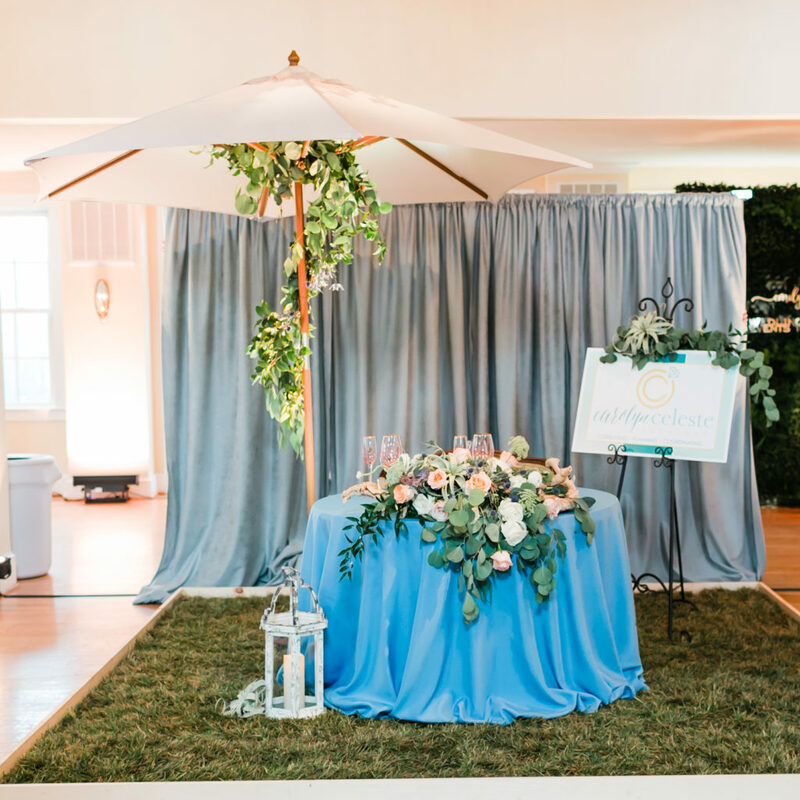 Since February isn’t exactly prime time for beautiful green grass, Carolyn found another way to include it in her design, and paired with our Slate Polyester linen, this table was giving us all the spring/summer feels! 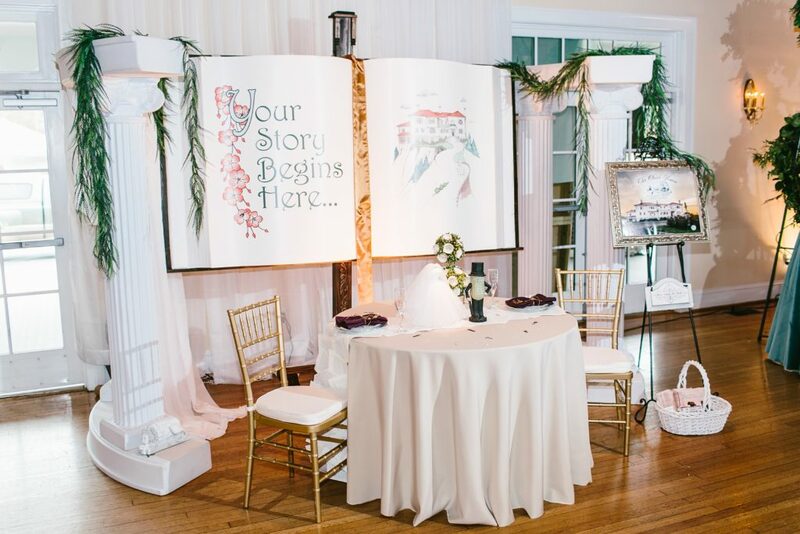 Design: Carolyn Celeste Weddings | Lighting: Blue Steel Lighting | Florals: Studio Posy | Paper Products & Graphic Design: PaperDolls Design | Setee: Mad Hatter Vintage | Turf/Sod: United Turf, LLC. 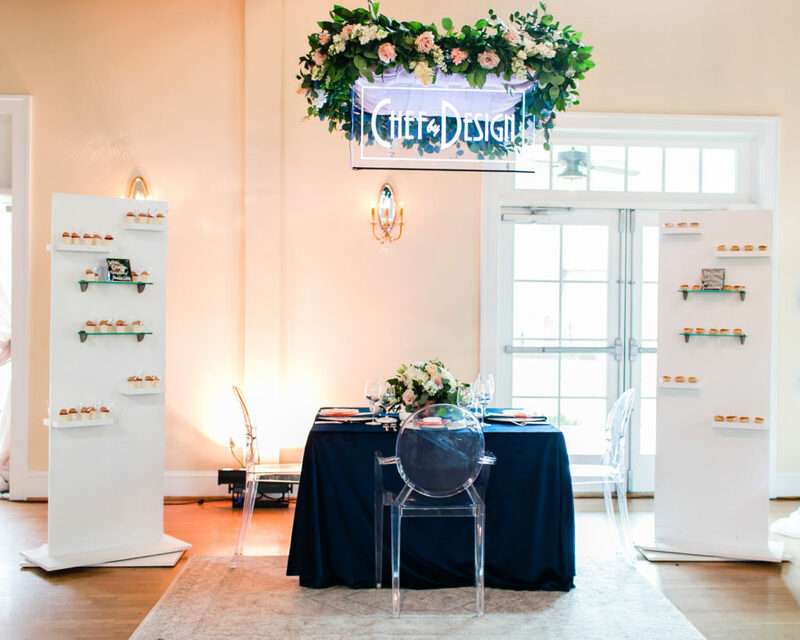 We still can’t get over the gorgeous sign that Chef By Design had hanging above their table! 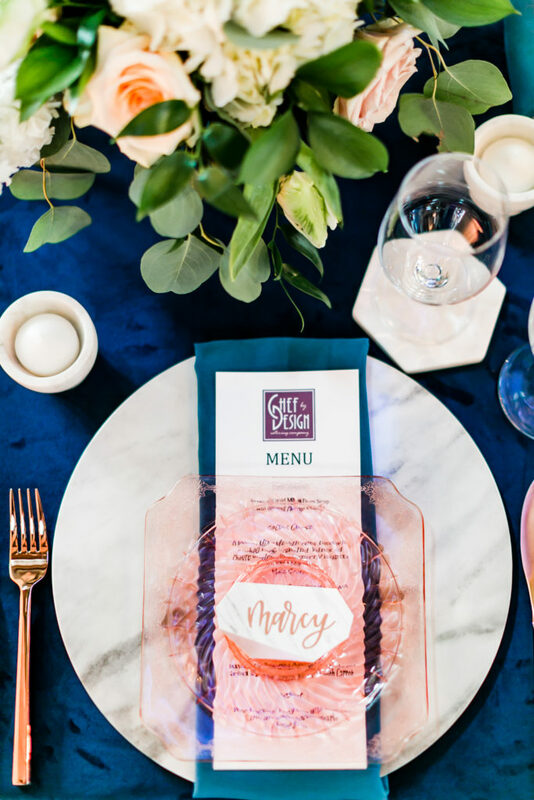 We loved the fact that Chef By Design decided to design a beautiful table setting with our Marine Velvet linen, yet also have two food displays on the side! 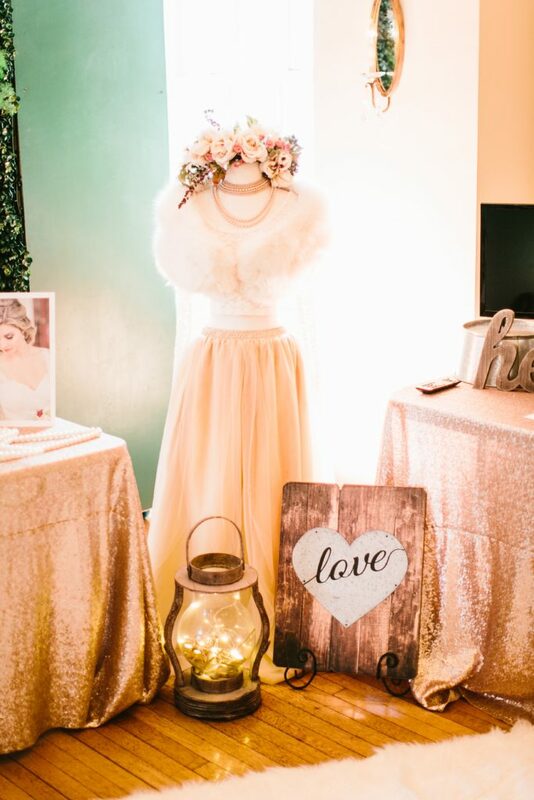 The whole look really worked well together, and just deepened our love for velvet linens! 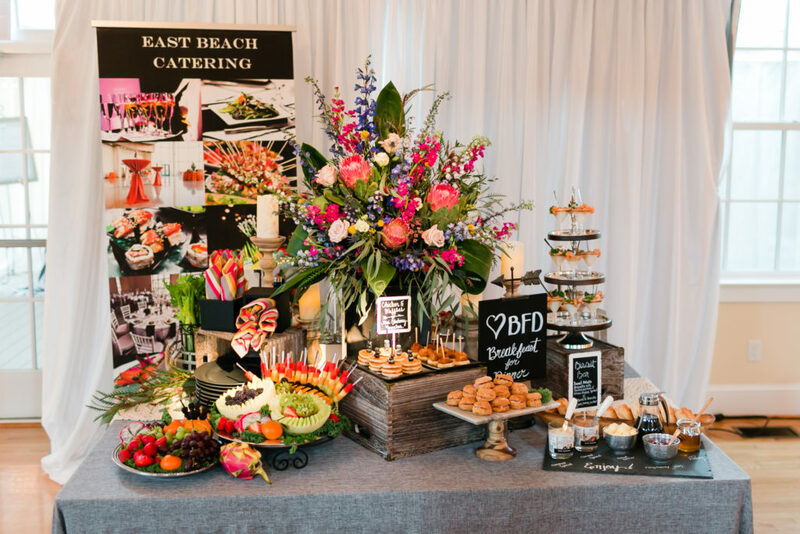 East Beach Catering completely knocked it out of the park in showcasing their catering options! 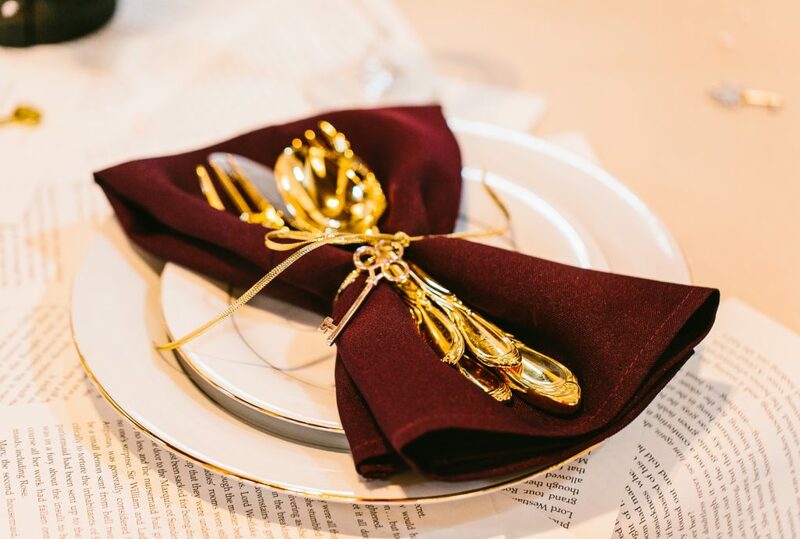 They had a wide array of items on their tablescape, and we (along with the attendees!) 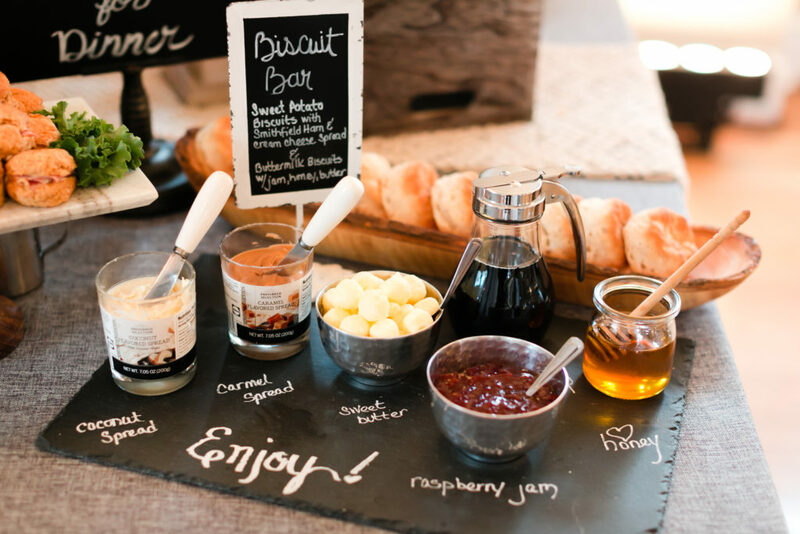 loved the fact they could get unique ideas to use at their weddings – such as a Biscuit Bar, or Bloody Mary Bar! 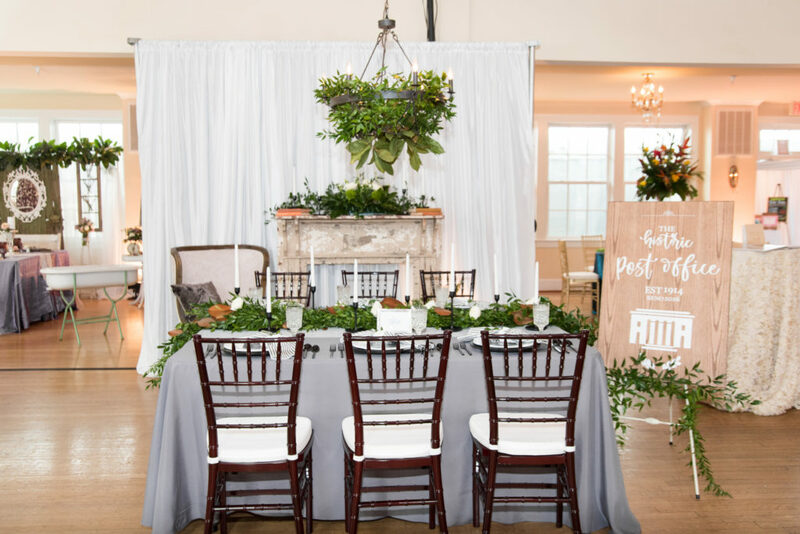 Our Charcoal Natural linen was the perfect neutral base for the table, and our Macrame Runner brought just the right amount of flare! 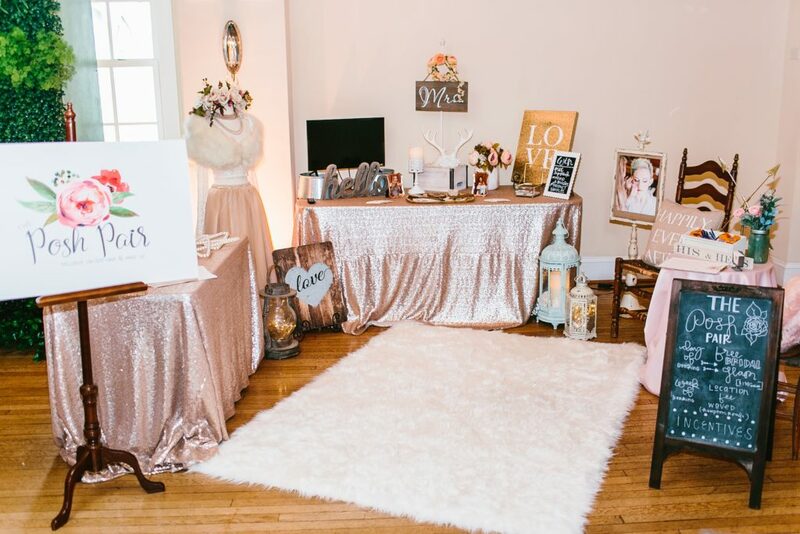 Soirees By Lauren completely nailed their table design at this year’s show! 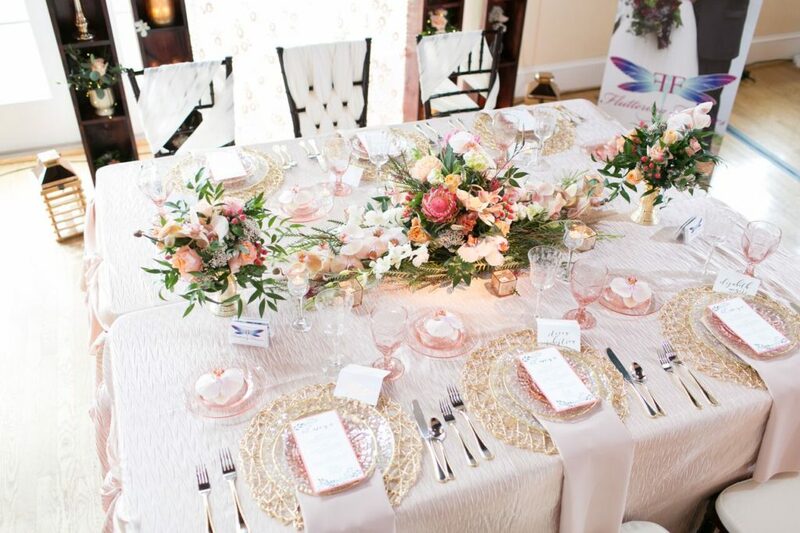 How amazing is our Mauve Floral linen that the ladies decided to use as their main table linen?! 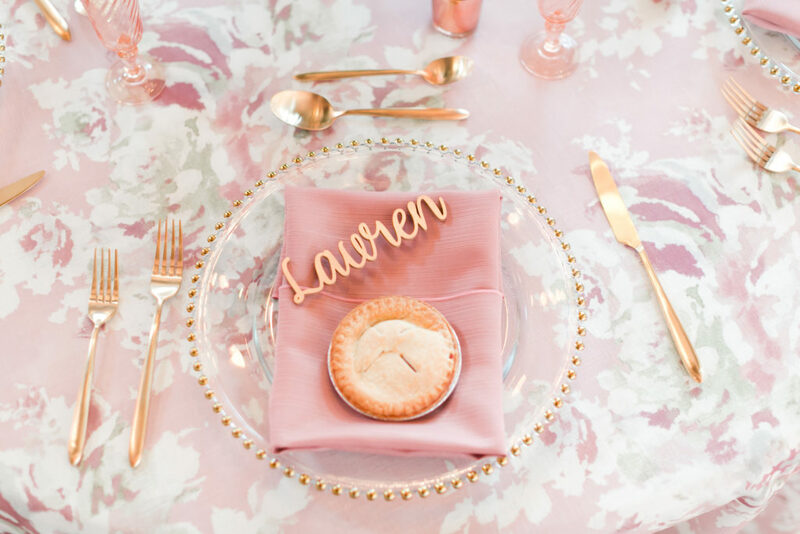 The mini pies and the cut out names on the place settings was a unique and personalized touch that we loved! 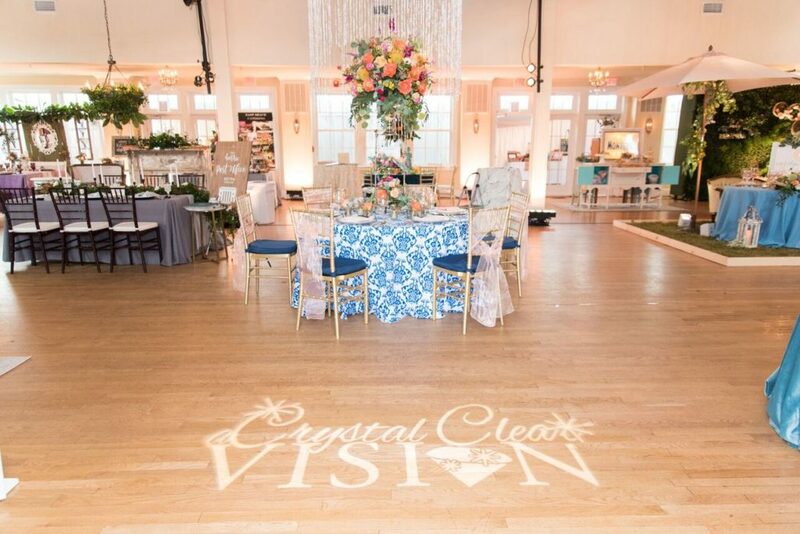 Keep checking back as we show off all of the tables and behind the scenes shots from A Crystal Clear Vision 2018! Today is Part 2 of A Crystal Clear Vision linens! 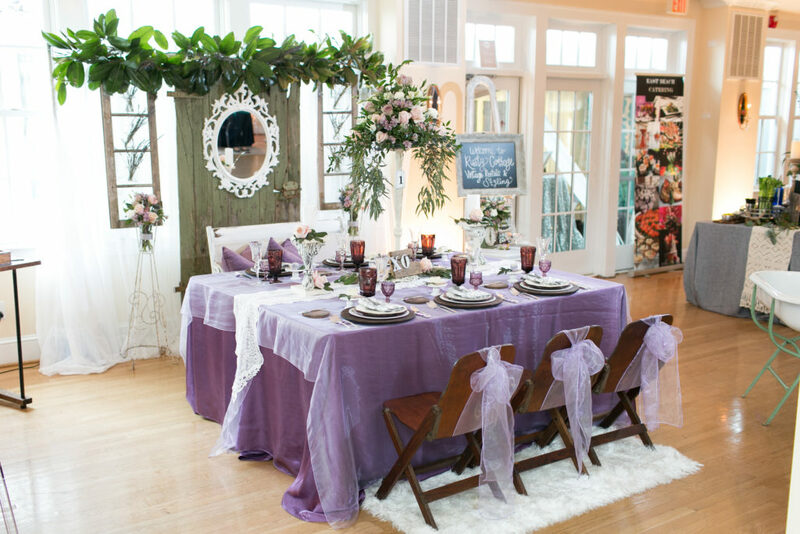 We’ve got 4 more tablescapes to show you with all of the linen and decor details! 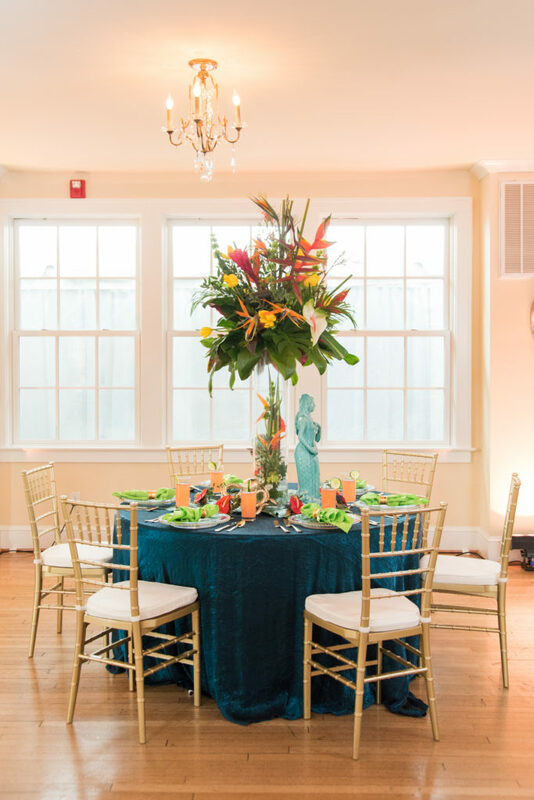 Check out the tables that Jessica Ryan Photography captured: Chesapeake Bay Catering, Fluttering Flowers, Rusty Cottage, & Traditions Catering. 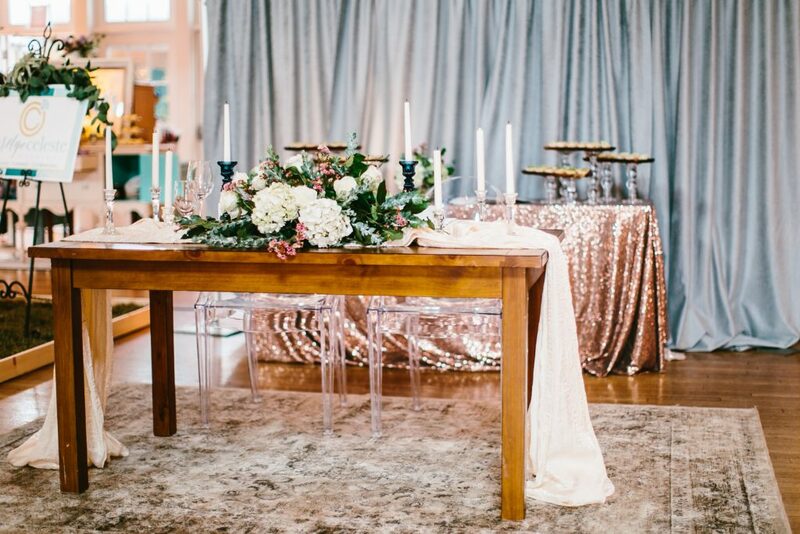 We absolutely adored Chesapeake Bay Catering’s table and their use of layered linens! 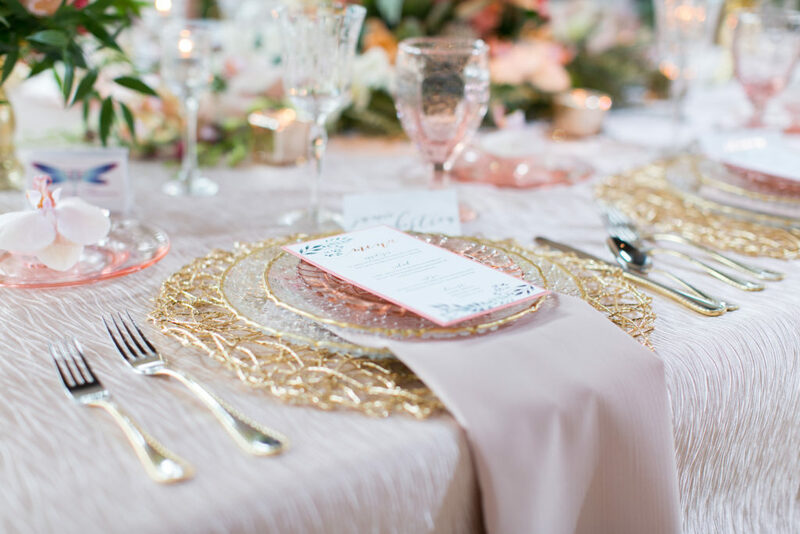 Our Champagne Leaf Petal and Gold Velvet linens looked stunning mixed together with the bright pop of floral that they had over their table! 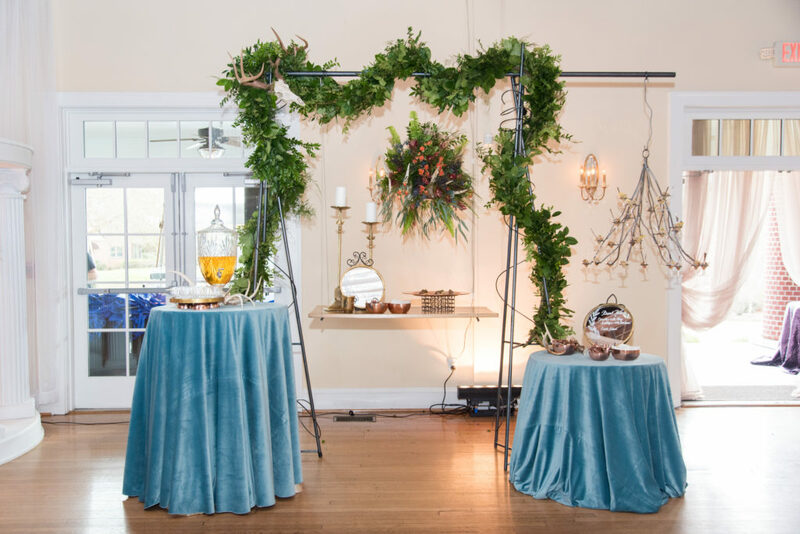 Design: Chesapeake Bay Catering | Lighting & Draping: Blue Steel Lighting | Florals: Leslie Hartig Floral Design | Signage: Jollity & Co.
Fluttering Flowers was definitely a crowd favorite at this year’s event – they won the coveted People’s Choice Award! 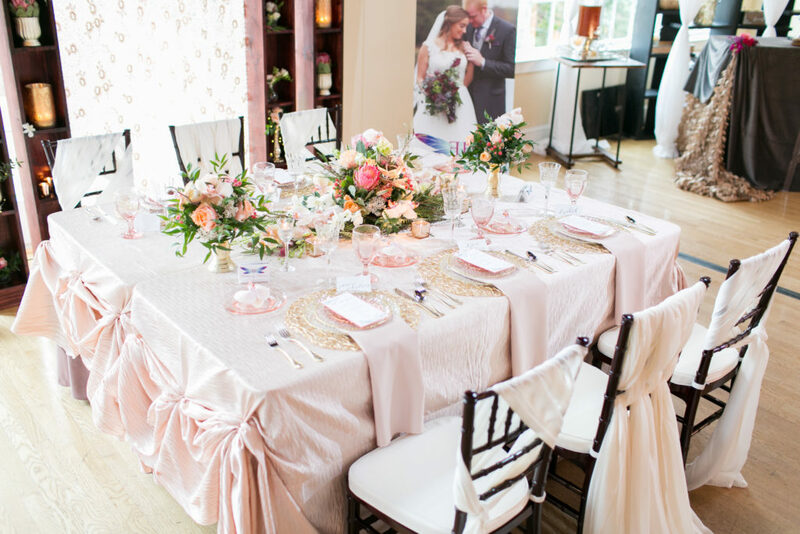 All of us Waterford gals were equally as smitten with their design as well – our Peach Wave & Rose Velvet linens paired beautiful with their other table decor, and don’t even get us started on that floral arch – love! 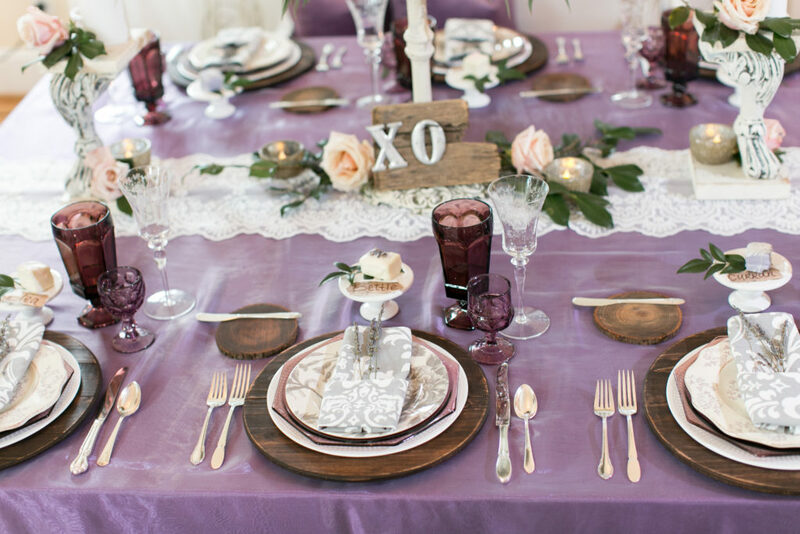 The Rusty Cottage tablescape was giving us all of the purple heart eyes! 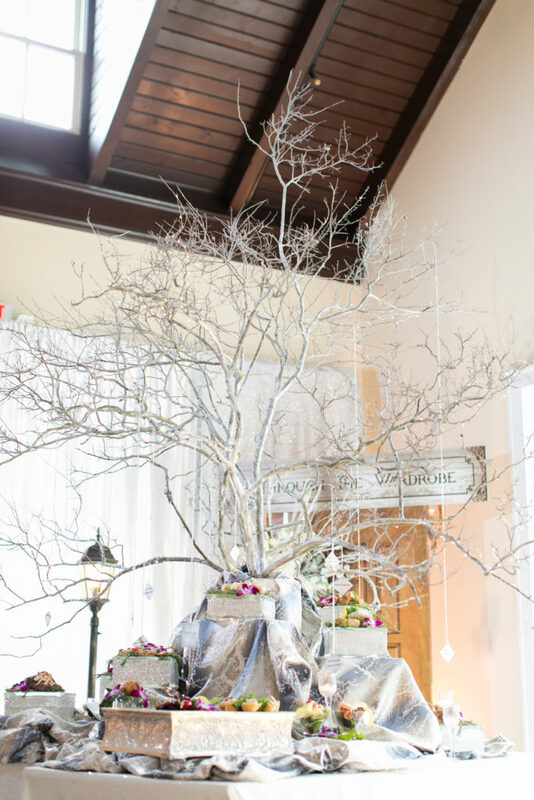 The theme of their table was “elegant farmhouse” and they completely nailed the look! 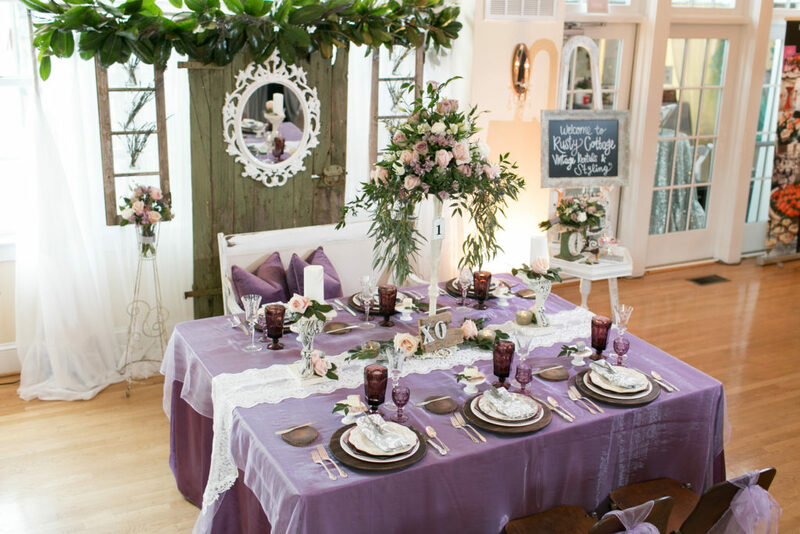 We adored all of the rustic touches mixed with our Wisteria Satin linen and Lilac Organza Overlay. 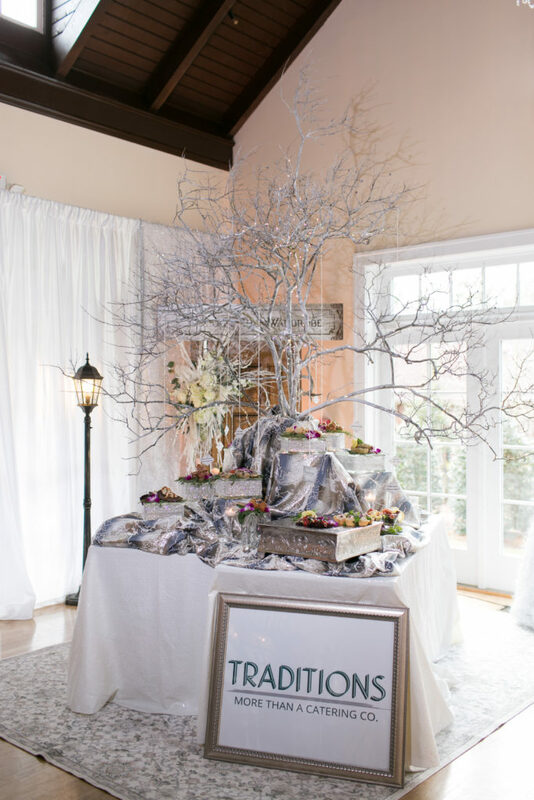 Traditions Catering was giving us all the winter vibes with their table design! 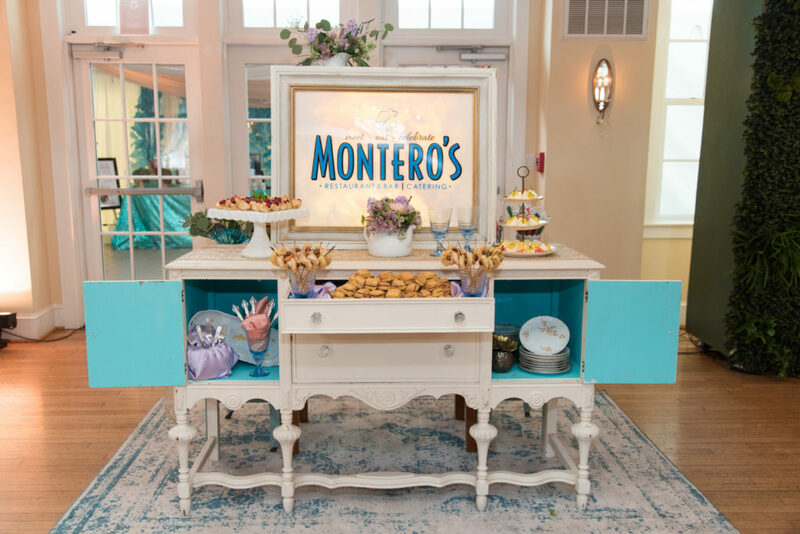 Like we said last week, the catering companies really knocked it out of the park! 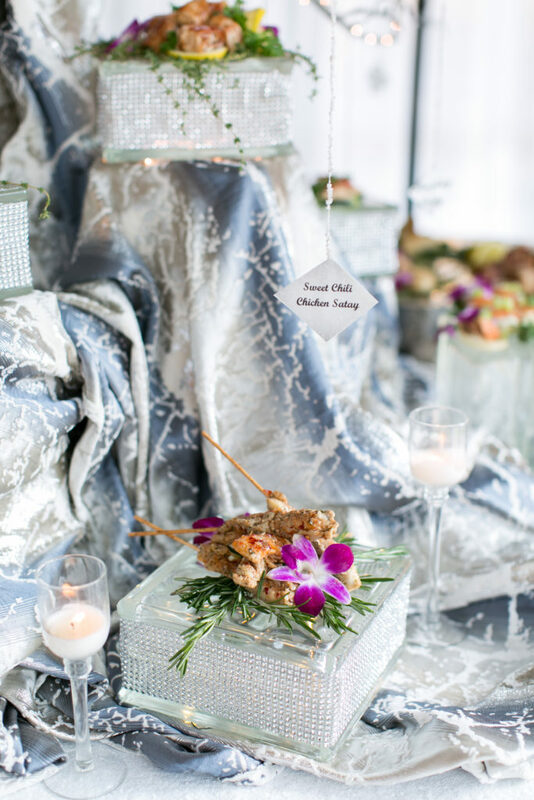 We loved how much detail and thought Traditions put into their design and the way their food was showcased on our Silver Marble and White Sequins linens was perfection! 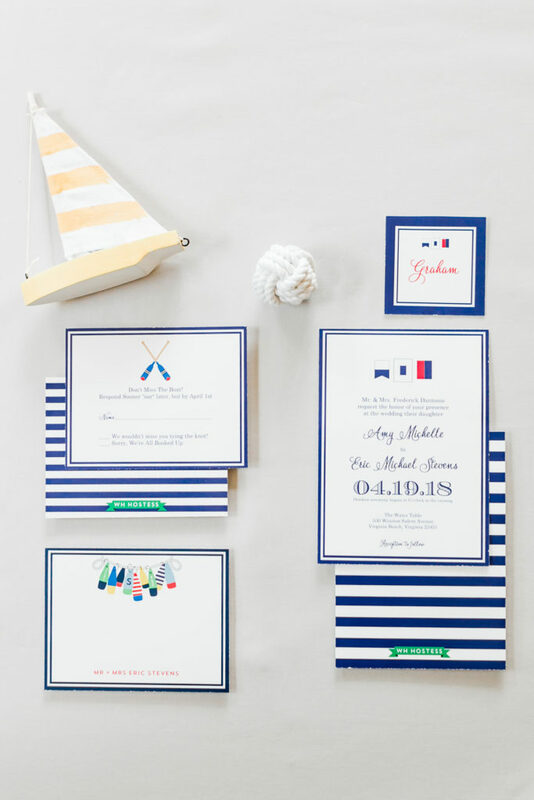 We are SO excited about today’s Waterford Wednesday post, friends! 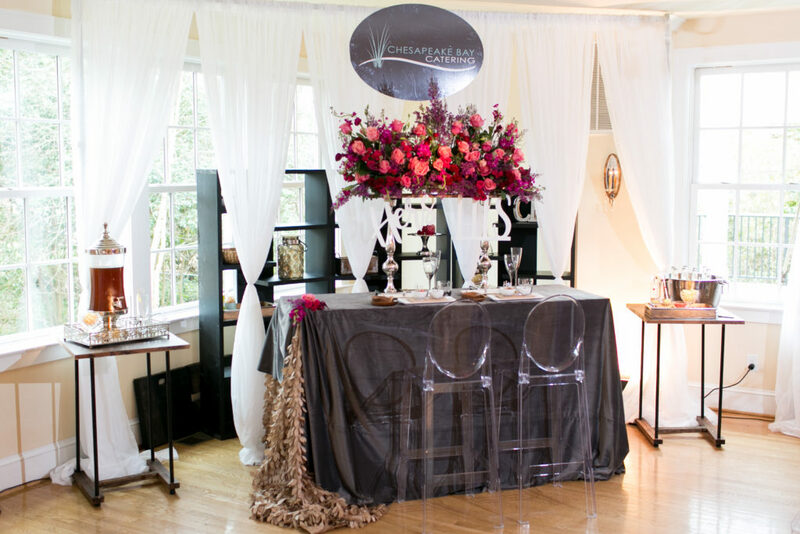 A Crystal Clear Vision 2018 was just a couple of weeks ago and we already have the images back from each of the photographers who were on site! 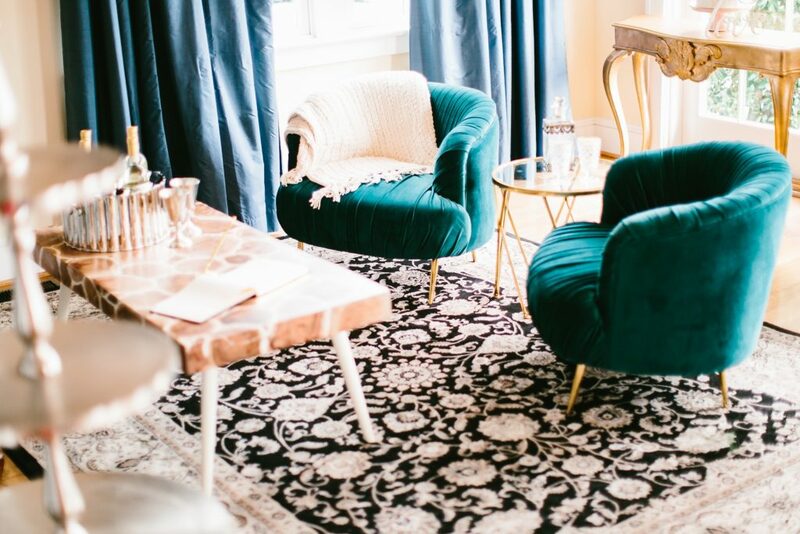 We have been bursting at the seams waiting to show you all these AMAZING photos, and today is finally the day – well, for a sneak peek at least! 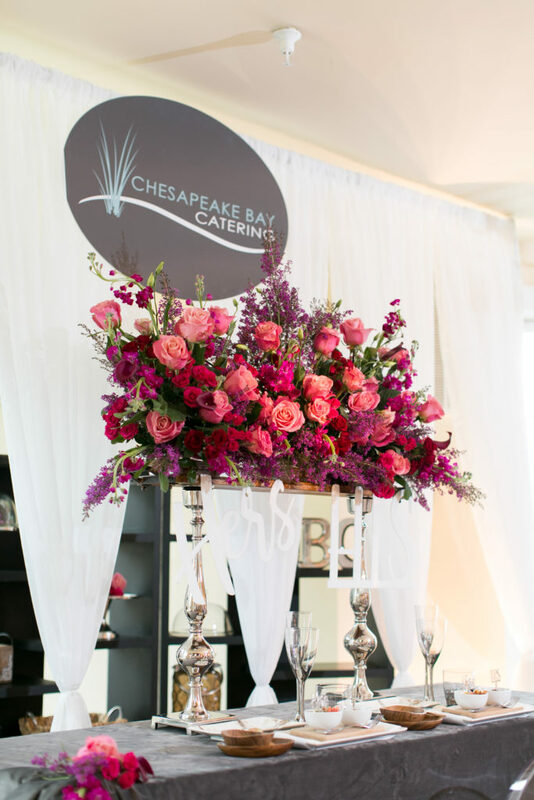 This years event was one for the books…our guests enjoyed champagne, food samples from the best caterers in Hampton Roads, free valet, ice cream from Lolly’s, inspiration from our area’s top vendors, amazing lighting options, awesome floral, music from Astro Entertainment, linens galore and, we even gave away a complete wedding package! 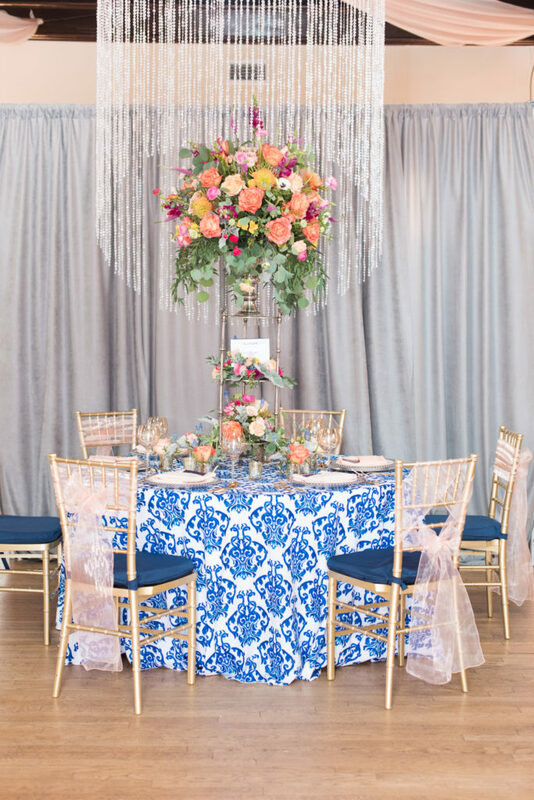 Today we are thrilled to show you pictures of the 20 fully set reception style tables designed by the top wedding professionals in Hampton Roads. 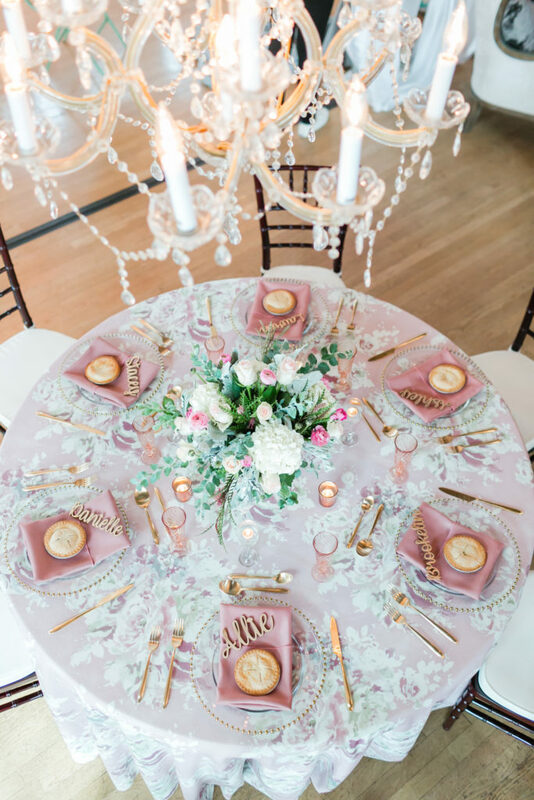 We will let the pictures of each of the tables do the talking! We have MANY MORE more pictures and posts to come, so please be on the lookout! 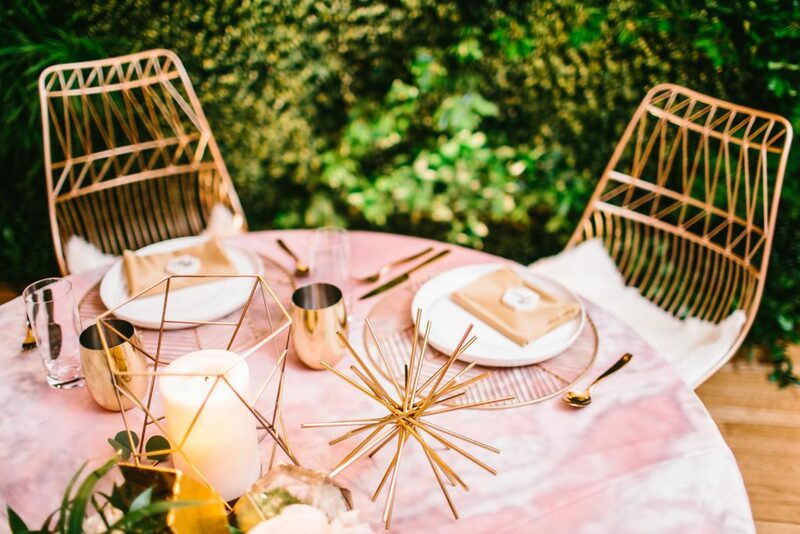 We can’t wait to show you all of our amazing sponsors, details on linen/decor from each table design, and even some behind the scenes scoop! Don’t forget to check back in with us for the next couple of weeks as we share even more A Crystal Clear Vision 2018 pictures! 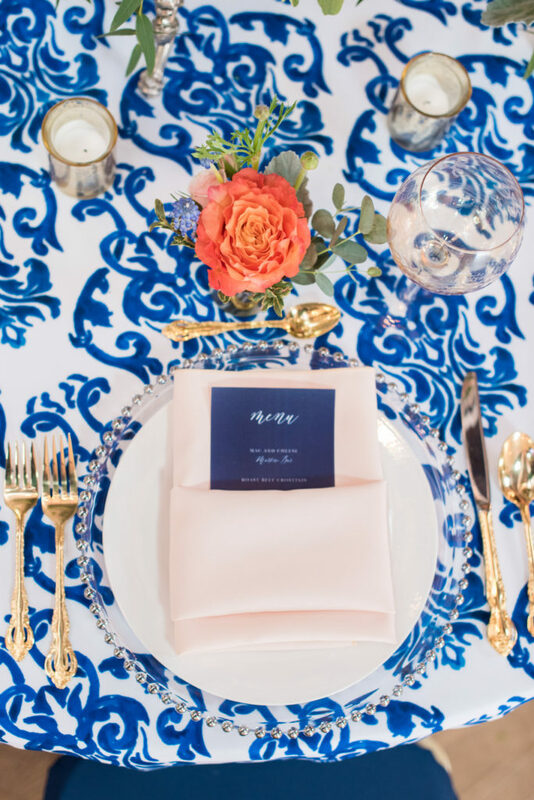 It has been quite the week for Waterford with two huge announcements! 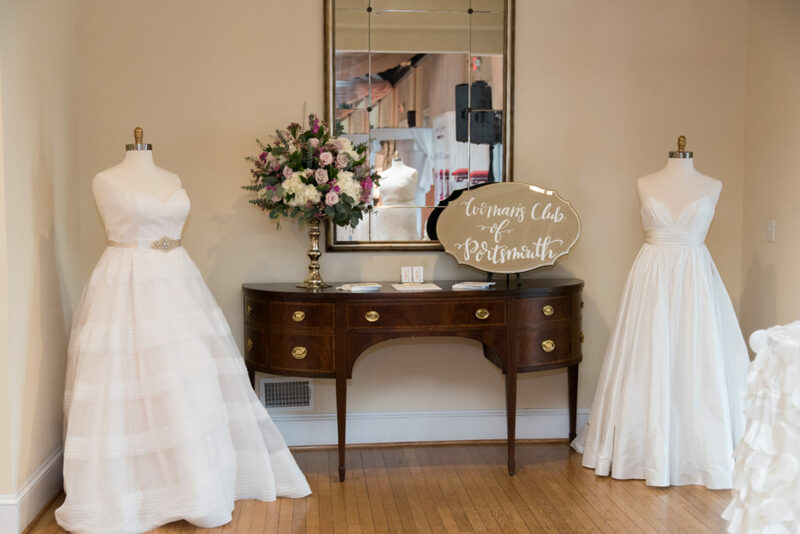 First, we are SO excited to be partnering with The Historic Post Office to offer mahogany chiavari chairs on-site when their venue opens this December! And second, A Crystal Clear Vision is back for another year on March 4, 2017! 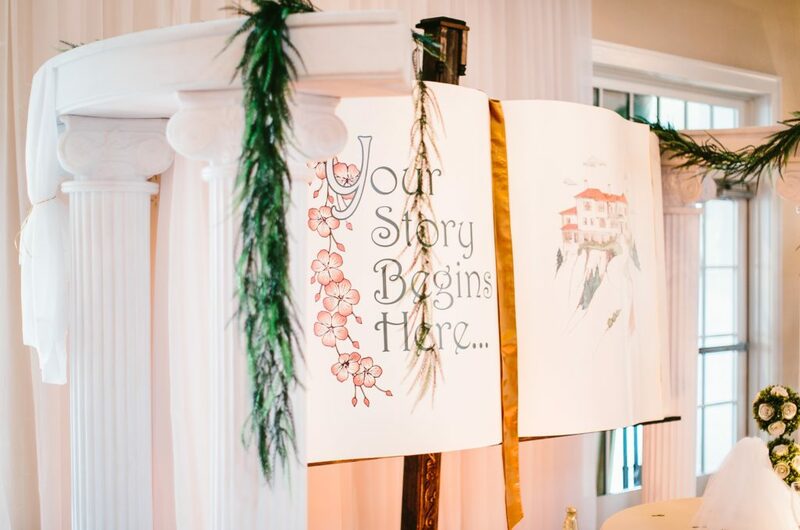 This year is going to be even better than last year, so save the date and stay tuned for more details! 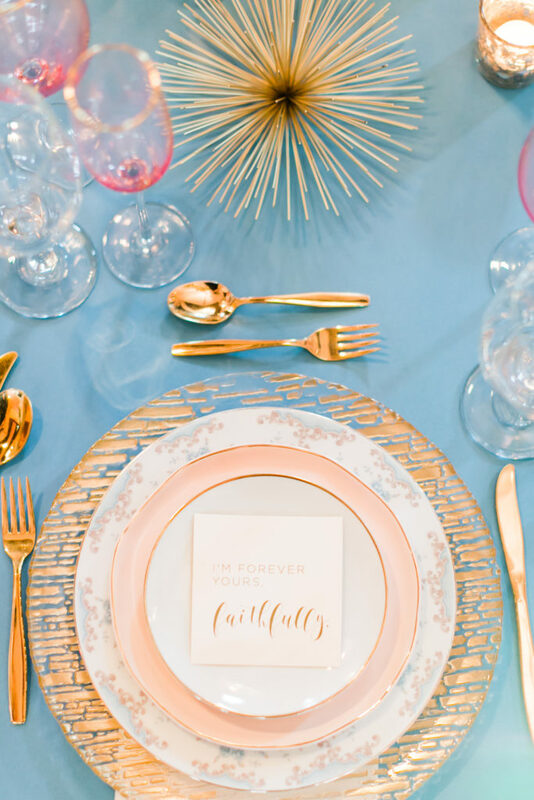 This time of the year is always one of our favorites, as there is so much “behind the scenes” planning in the works with design meetings and planning for upcoming bridal shows, so today we’re sharing two different ways to achieve the perfect style for your event to make it unforgettable! Fresh, clean, and uncomplicated! 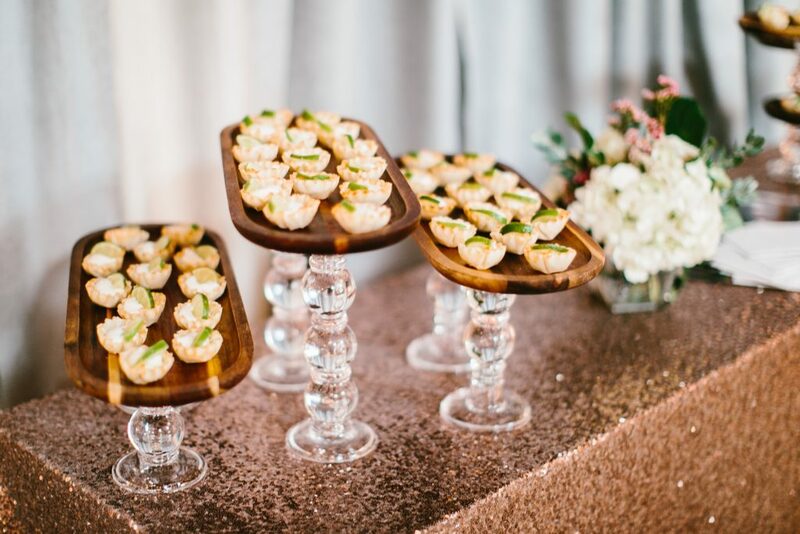 Every event is unique with it’s own style, and if you’re someone who believes that “less is more,” a simple event style is the perfect option! 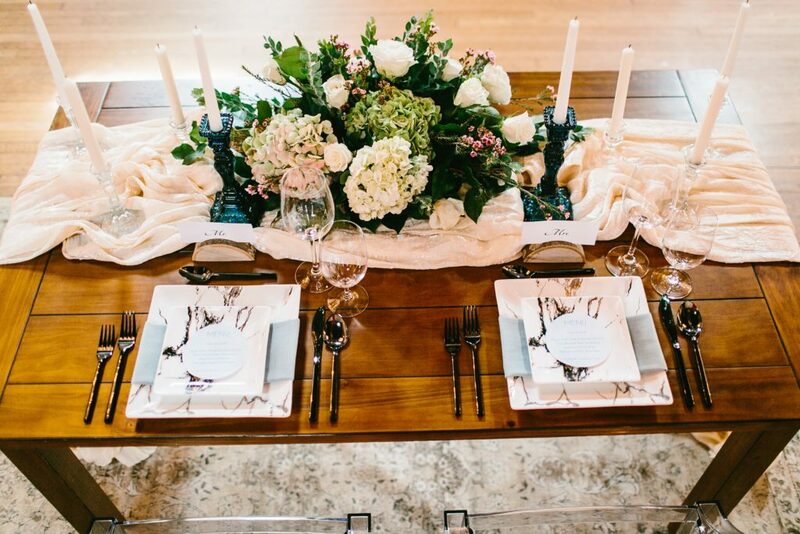 Choosing from our basic table linens in neutral colors is the perfect way to achieve this particular feel. 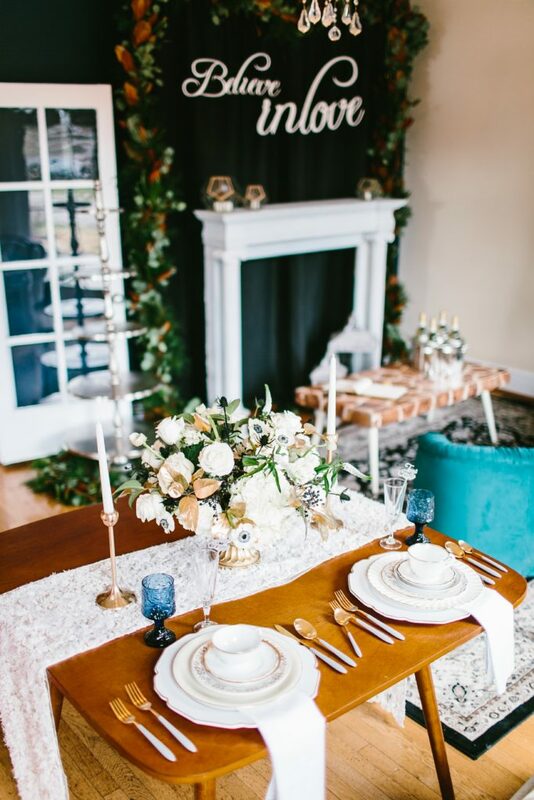 A table cloth in white or ivory would be a great starting point and adding a table runner or overlay in a similar neutral tone would bring the table together elegantly! 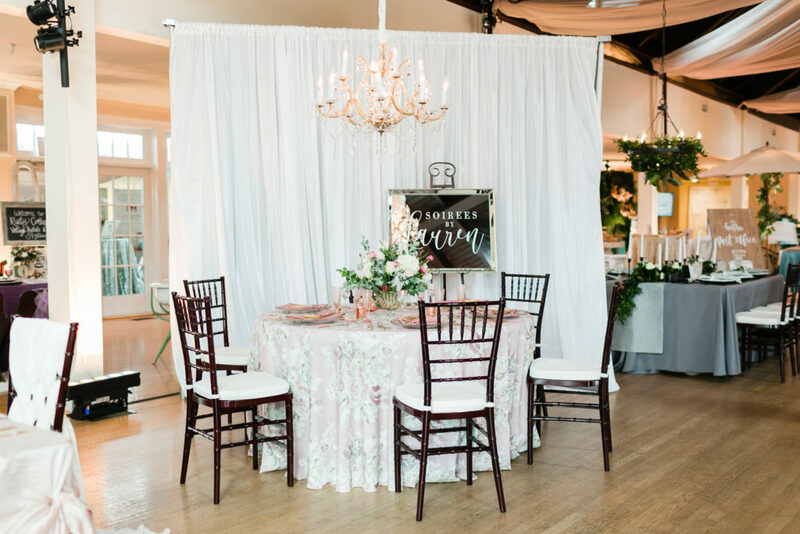 The addition of a white or ivory chair cover with a neutral sash, or a classic gold chiavari chair would round out your event perfectly! 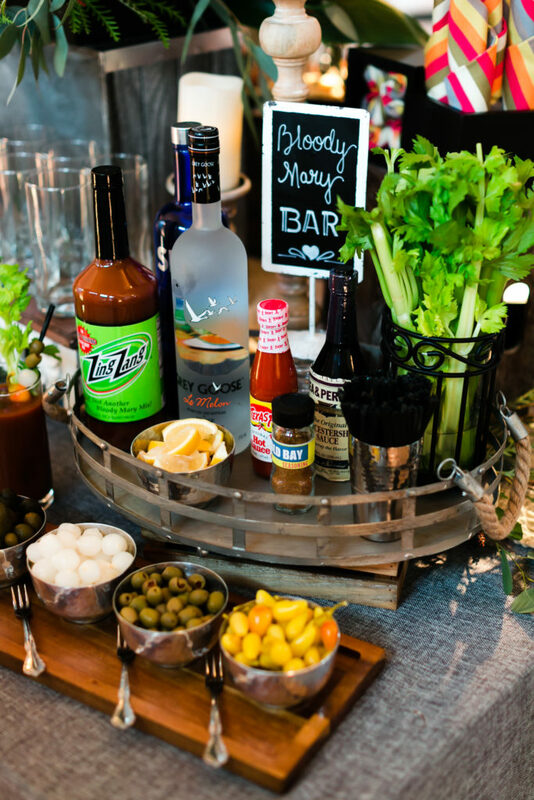 While some people like simple and classic, others believe that if you’re going to throw an event, you better go big! 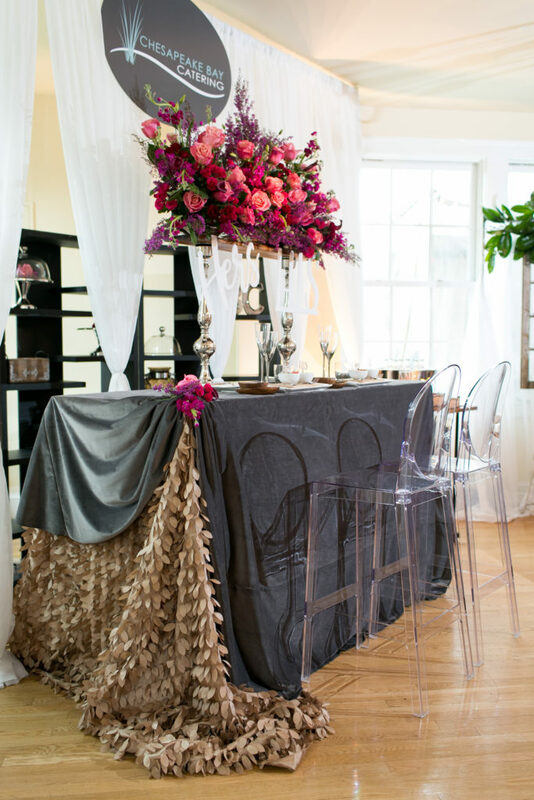 If an expensive look and feel is what you’re going for, an extravagant and glamorous design is the way to go! 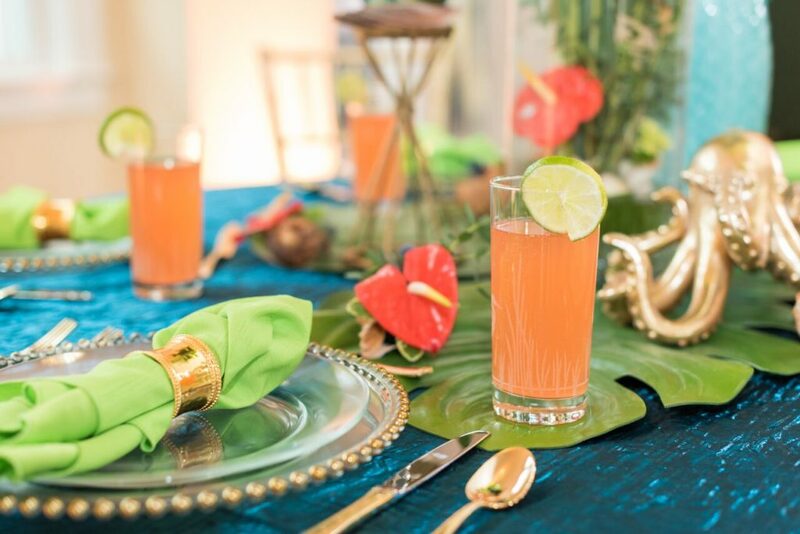 Choosing from our specialty linens would be a great starting point for creating the perfect “glam” look. 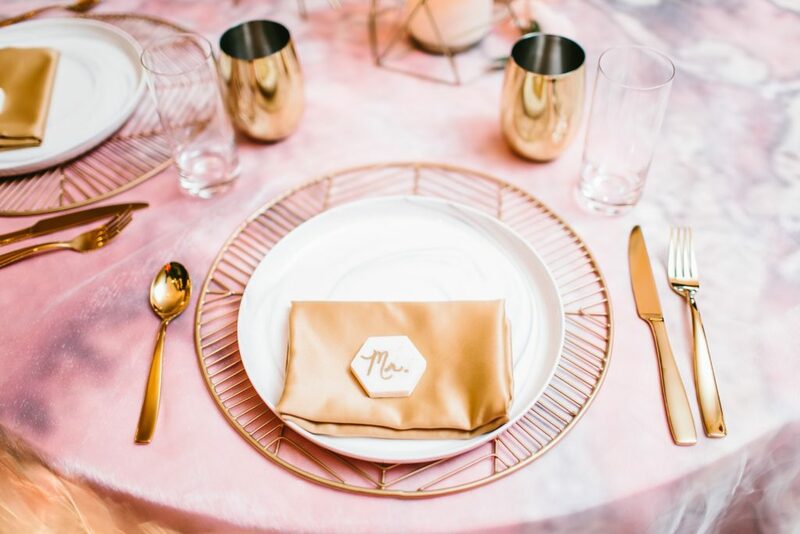 Adding a pop of sequins, whether it be in a table runner, overlay, or full length table linen is an obvious necessity to round out your lavish event! 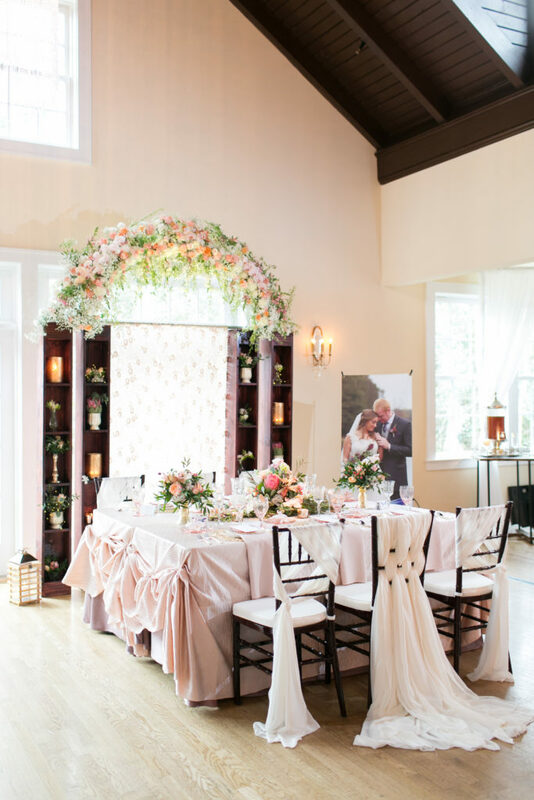 Instead of choosing a basic white or ivory table linen, a gorgeous full length satin or pintuck would make for a stunning overall look! 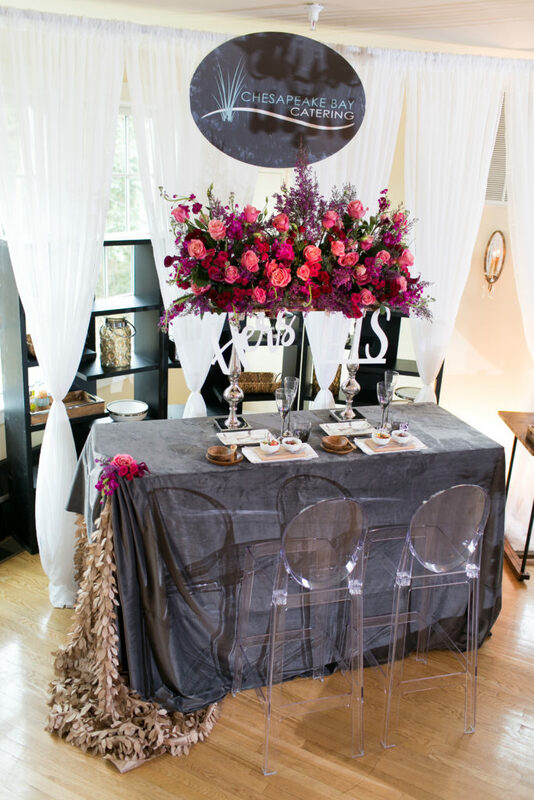 Of course, a “wow” centerpiece is a MUST with your glam linens! 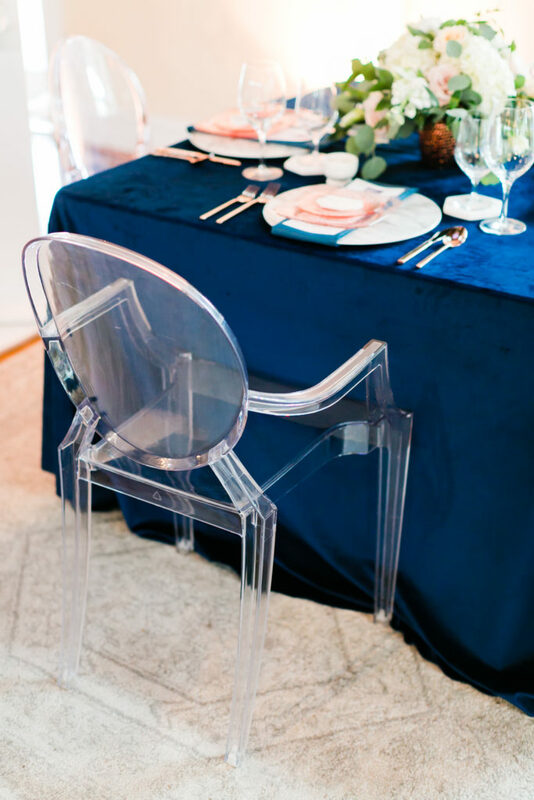 If you’re looking for more table design inspiration, keep checking back for updates on our annual A Crystal Clear Vision show! 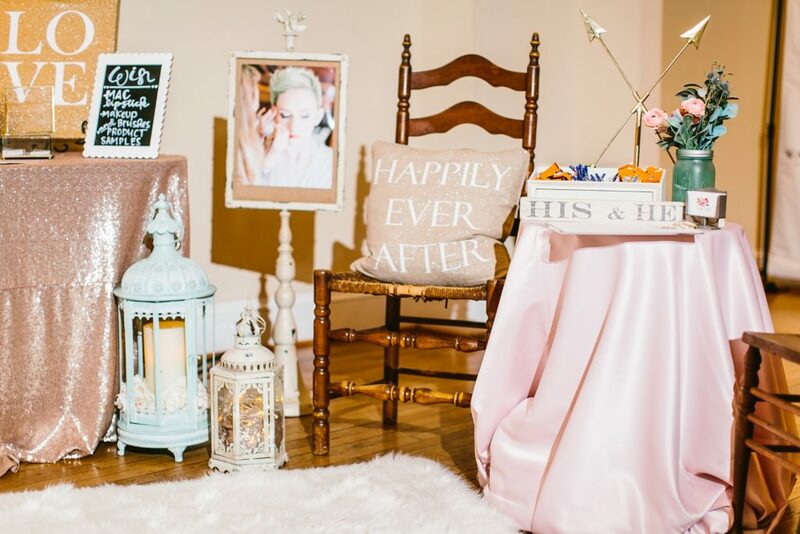 This is the perfect show for all you brides to be to gain exclusive design ideas!